Sometimes I think that when you’re a 26-year-old guy with a great job, an awesome girlfriend, really nice friends, and having the respect of your peers and colleagues in spite of imaginary chips on your shoulder, the last thing you should worry about is the taste of tocino. But I do: if only because you trade off a few things here and there as you do what all other 26-year-olds do. It started out as one of those usual trips to the Jollijeeps to buy lunch… that was until my senses were tickled by the familiar, delicious smell of that old Filipino staple, tocino. I haven’t had it in months. Not tocino per se, but the tocino I actually like. Mind you, it wasn’t always like this. 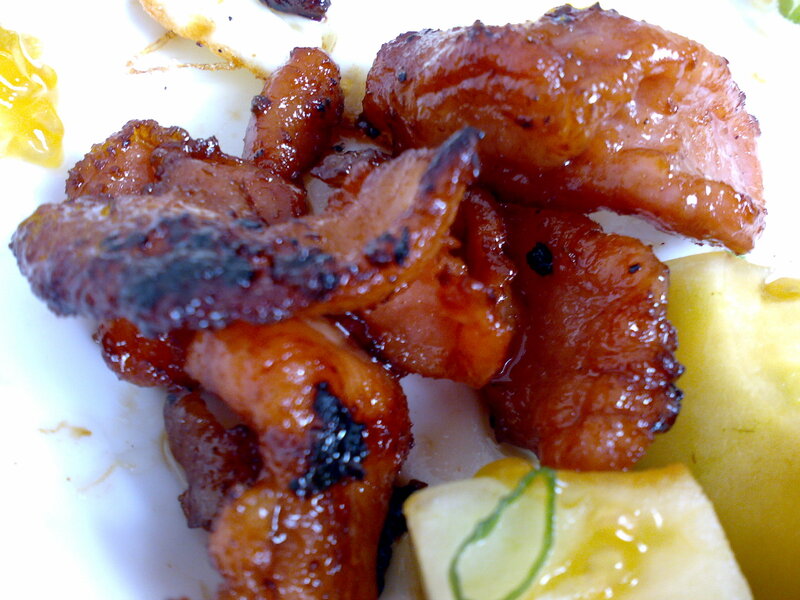 When I was a kid, tocino was regular fare for breakfast and lunch. Mom liked it because it was fairly easy to cook and not prone to spoilage, and I liked it because it was filling and sweet. Every weekend on his way home, my dad always bought home packs of the stuff along with other meaty treats we always had for lunch: chicken hotdogs, longganisa, embutido. Then there were the ham slices that, as years went by, somehow became much thinner, much more round around the ages, and over time, smaller and fattier. The tocino I had was quite hard to eat, but a steal at around 40 pesos; considering the high prices of food in Salcedo Village, you make do. Not necessarily enjoy. Living here, though, makes me wish at times for room to cram a stove in my apartment for the sole purpose of cooking tocino, or something like that. Tocino, just the way I like it: thin but meaty strips, crisp around the edges, drippings and oils drizzled around garlic fried rice. The fatty parts crisp but not burnt, chewy and oily. Sweet, a tart note at first bite, with the pleasant aftertaste of anise and saltpeter. Then there’s the egg over easy, the runny yolk drizzled over a few pieces and eaten just as it is: perfect, made at home, simple. “Make do. Not necessarily enjoy.” That’s a bit interesting: growing up, with a career and all sorts of responsibilities coming your way, the thought of “making do” is somewhat a hallmark of adulthood. There was a time in my life that I thought that my parents will always be there to help me in my time of need – cravings for tocino included – until I grew old enough to realize the kinds of choices and responsibilities involved in something as simple as homemade lunch. The same goes for everything: dirty laundry, medical checkups, or the occasional need to rant about your problems hoping that they could help. Often, with them being far away and me growing old enough to make choices for myself, it’s often up to me. More often than not, those rants become Facebook status messages. At least, I have outlets. Right. But that’s the thing about “making do:” you set goals low enough for you to reach and be a little more happy for the “little things in life” and “life’s simple joys” to the point that you become your own tocino: raw inside from lack of openness, charred outside from all your failures and showing it to the world as some badge of honor, and mediocre at best. And I’m kind of sick of settling for that and throwing my aggression on people who succeed simply because I can’t, or I don’t, and I settle for what’s there. And that is so true for too many people. I guess it’s time to go for a better taste. And I guess those things are the ones that I shouldn’t leave to compromise. Although it’s interesting what kind of bad tastes in the mouth a bad tocino can leave, etched in your soul. Life, like the taste of tocino, is best lived when you don’t settle for anything less. Previous postHello. Lionel Richie. Translated.